Our 2013 theme, Homeopathy to the Rescue! 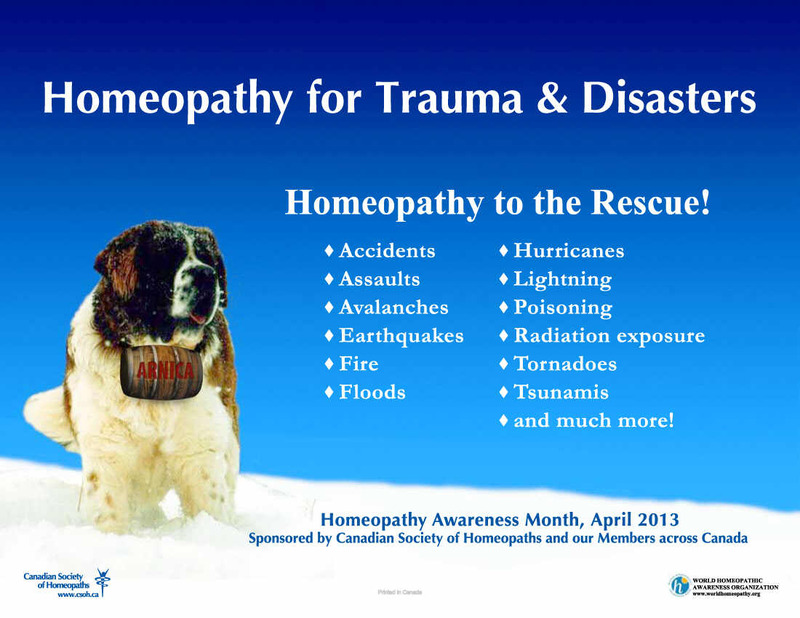 Trauma & Disasters, focused on the many ways in which homeopathy can help with the acute (first aid & emergency) and chronic (long-term) conditions resulting from trauma and disasters. These causes can include accidents, abuse, prolonged stress, and natural disasters. CSH-sponsored Awareness events, media coverage, information sessions, and special discounts are listed below, arranged by province from West to East, and alphabetically by community within each province. 20% Discount on all homeopathic consultations during Homeopathy Awareness Month for the treatment of problems arising out of mental and emotional traumas and physical injuries. Natural First aid for Moms - Homeopathy to the Rescue! Learn about using homeopathy to treat injuries and other acutes (flu, fevers, colds) that upset your child. Ask about the 20% discount for new patients who attend. Free public talk about what homeopathy is and how it can be used to treat minor injuries and traumas. Please pre-register at 604-741-7691. 20% discount on all initial consultations booked during Homeopathy Awareness Month. Expect to come away from this talk with some understanding of Homeopathy and the ways in which it can help with both acute and chronic complaints arising from traumatic events, both physical and emotional. Featuring prizes and surprises! Admission is by donation with proceeds to the Kootenay Animal Assistance Program (KAAP). 20% Discount on all homeopathic consultations during the month of April. Mothers and mothers-to-be are especially welcome! 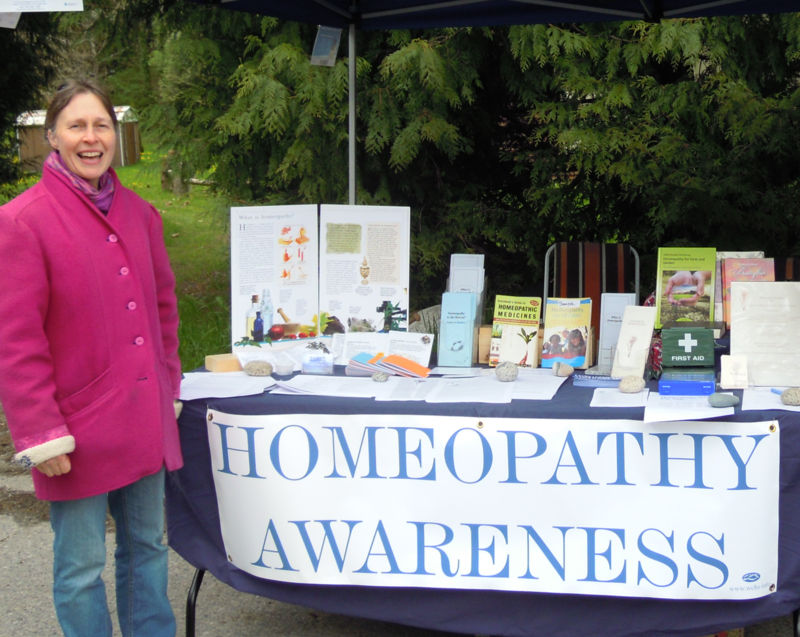 Meet your local Steveston homeopath, Catherine Dean, to learn about the different approaches to homeopathy that can help you be prepared to treat a wide range of minor physical and emotional traumas that may occur at or away from home. Free draw for Hylands Bio XII tissue salts. Find our Homeopathy to the Rescue! information booth at the Earth Day Celebrations in Roberts Creek. Display materials and handouts available and a CSH homeopath will answer your questions about this ecologically-sound, safe, gentle, and effective wholistic healing. 20% discount on all consultations held during Homeopathy Awareness Month. Offer extends to the end of May. Learn more about homeopathy and its role in the treatment of problems arising out of mental and emotional traumas and physical injuries. The top three remedies useful in such situations will be discussed in the lecture. Limited seating so pre-registration is required. Please reserve your seat by April 9 at 5 pm. Stop by my booth to learn about basic first aid remedies for injuries, plus the benefits of homeopathy in restoring balance in life and maintaining overall well-being. Ask me about the importance and advantages of taking homeopathic medicines, what homeopathy can treat, and how the remedies work. Kids are welcome -- look for juices, balloons, and 5 free draws! 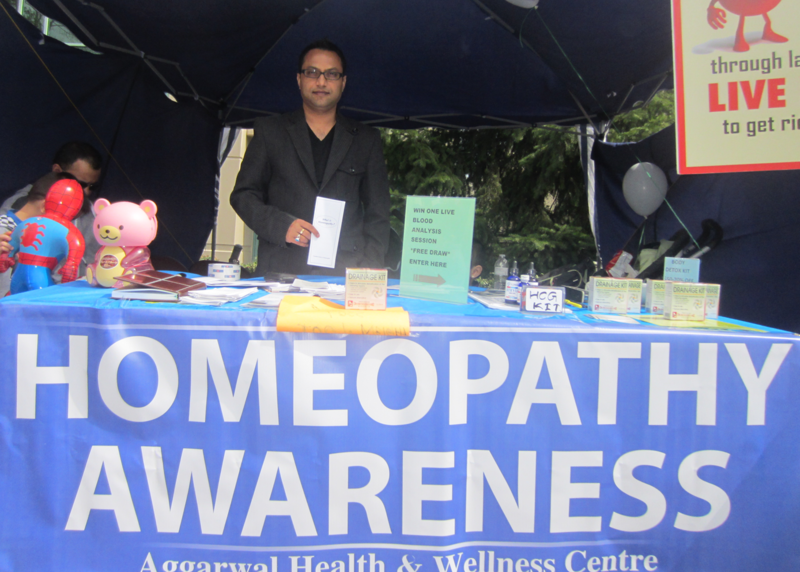 Adults can enter a draw to win one free homeopathic consultation. At the Vaisakhi Parade in Surrey on 128 Street between 76 and 84 Avenues. Click here for a copy of an article I wrote as part of my effort to spread the awareness of Homeopathy. Join me and over 100,000 others in celebrating the Sikh new year at one of the largest Vaisakhi parades outside India. At the Vaisakhi Parade in Surrey. 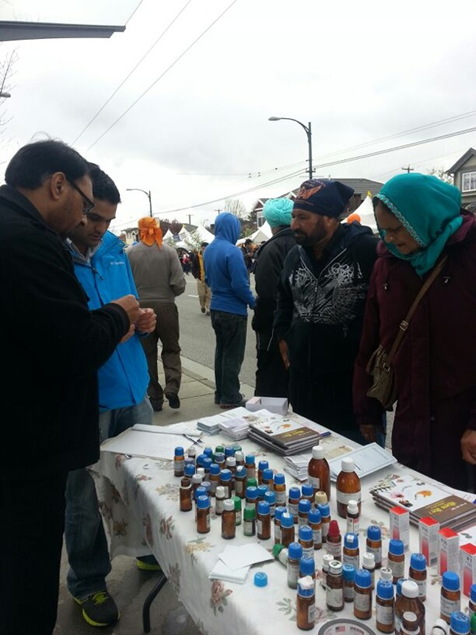 Free mini-clinic and information booth with displays of homeopathic medicines at the Vaisakhi Parade in Surrey. Emphasis will go to the use of homeopathic remedies for treatment of diseases in general and for treatment of problems arising out of mental and emotional traumas and physical injuries. See for yourself how homeopathy works! Side street near 81 Avenue and 128 Street, where my clinic is located. Ask about Homeopathy Awareness Month and receive 20% discount on all homeopathic consultations during the month of April. If you are interested in joining the next Foundation Course at VHA in September 2013, you're invited to come to the Academy to spend the afternoon sitting in on a lecture. Meet current students, recent graduates, and faculty members, who will be able to answer any questions that you might have. Certified homeopath, El Cecchetto, will be on hand to answer your questions about homeopathy and your family's health in common acute and first aid conditions. Free reference material and copies of scientific studies available. Celebrate the Sikh New Year with thousands of devotees at the annual Vaisakhi Parade in Vancouver and stop by the homeopathic booth for information on how homeopathy can be of help in many cases arising from physical or emotional trauma. See for yourself how homeopathy works! Stock your first aid kit with natural products and learn how to treat bruises, bug bites, cuts & wounds, scrapes & scratches, sprains & strains, and sunburn. Take home a ready-to-use calendula pack, a bottle of Arnica, an informative pamphlet, and answers to your questions! Sign up during April for Sheri Nakken's online introductory course on homeopathy and receive a $45 gift certificate for constitutional homeopathic care with Heather Hawthorne. Take online classes in the comfort & convenience of your own home, on your own schedule, and gain a solid grounding in the basics of the science of homeopathy and learn how to use homeopathy at home for minor acutes and first aid situations. Make sure to visit the Riva's Remedies booth during the Mane Event Horse Expo of the Year! Check the Show Guide for Speakers Schedules for date & time of Marijke's two power point presentations on natural horse health, nutrition, and homeopathy with a variety of case studies. Learn how to successfully prevent and treat: colic, diarrhea, parasites, cribbing, ulcers, laminitis, metabolic syndrome, skin problems, immune disorders, allergies, arthritis...and more. Bring your questions! Free talk on homeopathy and some of the remedies to have on hand to treat minor injuries for your family and pets. Also covers how to know when to refer to a professional homeopath for long-term chronic conditions and to build resistance and maintain overall wellness. This free talk will help you prepare for summer - parents and the general public are invited to attend. Homeopathy has a lot offer to help when you prepare for the not-so-nice parts of summer. Learn about how to put together a homeopathic first aid kit and about some of the important first aid remedies and their application. There are great remedies to deal with different emergency situations from bleeding wounds to sprained ankles, concussions, burns, sun strokes, insect bites and the likes. In this talk I will introduce remedies that you can put into your homeopathic first aid kit, so that you have them at hand when needed. Hope you have a safe summer! To obtain more information about homeopathy or a copy of the current Directory of Registered Homeopaths, contact the CSH office at 604-803-9242 or homeopathy@csoh.ca.